LagosPhoto proudly presents the third edition of its international photography festival entitled “7 Days in the Life of Lagos”, featuring 29 local and international photographers. Participating photographers in LagosPhoto 2012 include: Halima Abubakar, Bunmi Adedipe, Segun Adelfila, Aderemi Adegbite, Jenevieve Aken, Akintunde Akinleye, Kelechi Amadi-Obi, Lolade Cameron Cole, Medina Dugger, Delphine Fawundu, Maja Flink, Stanley Greene, Jane Hahn, Chantal Heijnen, Chinenye Godsproperty John, David de Jong, Benedicte Kurzen, Ruth McDowall, Jide Odukoya, Lakin Ogunbanwo, Olayinka Oluwakuse, Bayo Omoboriowo, George Osodi, Judith Quax, Olayinka Sangotoye, Alafuro Sikoki, Andrea Stultiens, Margherita Trestini, and Hans Wilschut. This year’s edition aims to capture the energy and vibrance that make the city of Lagos such a unique cultural environment. Lagos is the creative and business hub of Nigeria, arguably even Africa, an urban megapolis with a high population density. The rate of change in the city is also rapidly evolving with improvements struggling to keep pace with the restlessness and innovation of the people. Lagos is the most populous city in Nigeria, the second fastest growing city in Africa and the seventh fastest growing city in the world. 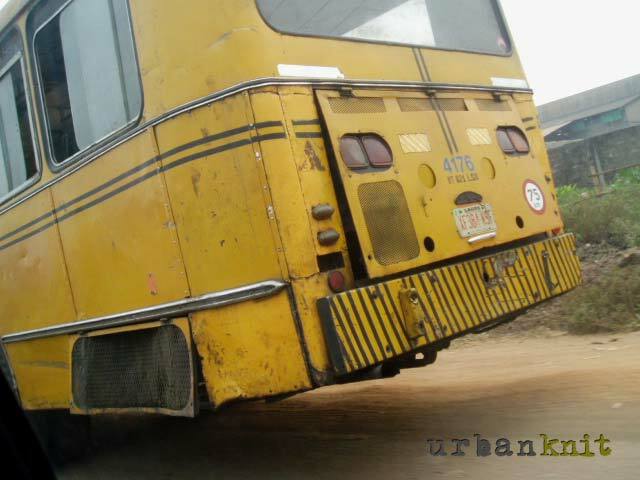 A city of extremes and contradictions, Lagos transforms with the fast pace of urban migration and the explosion of development and technology that is dissolving barriers and leading to new types of interactions. LagosPhoto 2012 aims to document the city of Lagos from a comprehensive and nuanced perspective, one that reveals the big picture by focusing on the minute details of social life. Photographers were nominated to document aspects of life in the city with an extended photographic project, with topics including religion, architecture, culture, nightlife, economy, music, lifestyle, sports, government, and infrastructure, among others. 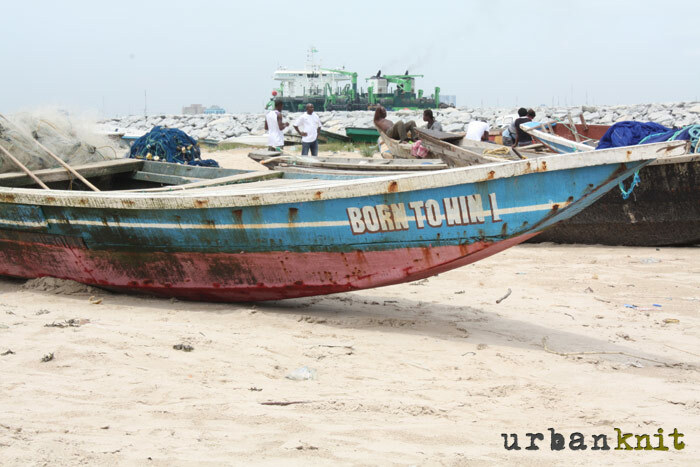 By providing a plural point of view that includes the many facets of daily life in diverse socio-economic communities of Lagos, LagosPhoto 2012 continues its philosophy in documenting and inspiring change through photography. 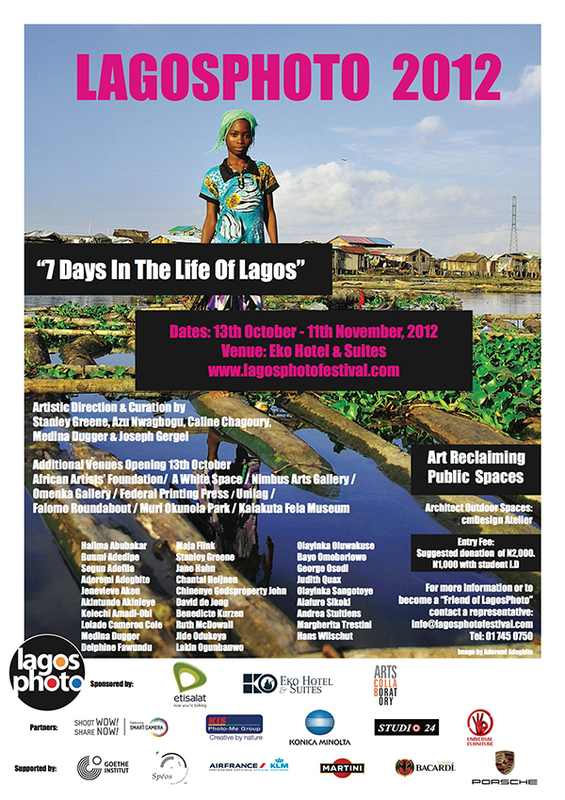 LagosPhoto 2012 will open with the official exhibition at the Eko Hotel & Suites. LagosPhoto 2012 extends its mission in engaging the city of Lagos and the public by extending the exhibition to nine simultaneous satellite exhibition spaces throughout the city of Lagos. Exhibition venues include the African Artists’ Foundation, Nimbus Gallery, A White Space, Omenka Gallery, The Federal Printing Press, The Kalakuta Fela Museum, Muri Okunola Park, the University of Lagos, and the Falomo Roundabout. An exhibition of photographs that document the ongoing demolition of Makoko will inaugurate the newly created LagosPhoto Projects series at the African Artists’ Foundation Gallery, where a group of photographers and journalists intervene in public spaces to reveal stories of the changing social landscape in Nigeria. Anton Cobijn’s photographs of Fela Kuti in the early 1980s will be exhibited at the Kalakuta Fela Museum in a partnership between Felabration and LagosPhoto. An installation of the Nigeria Nostalgia Project, an online digital archive of collected photographs, including vernacular images, video, sound bytes, press clippings, publicity stills, and various ephemera depicting scenes in people in Nigeria between 1960-1980, will unfold in an interactive presentation at A White Space. Goethe-Institut Nigeria will partner with LagosPhoto to present an installation entitledBlack.Light at the Federal Printing Press in Lagos Island. Black.Light is based on the work of renowned war photographer Wolf Böwig’s report on West African Civil Wars, and includes fifteen graphic artists from around the world in a combination of photographs, literary texts, and graphic novels. Outdoor venues such as the Muri Okunola Park, the University of Lagos, and theFalomo Roundabout engage public spaces throughout the city with exhibitions of large scale, durable outdoor photographic prints.